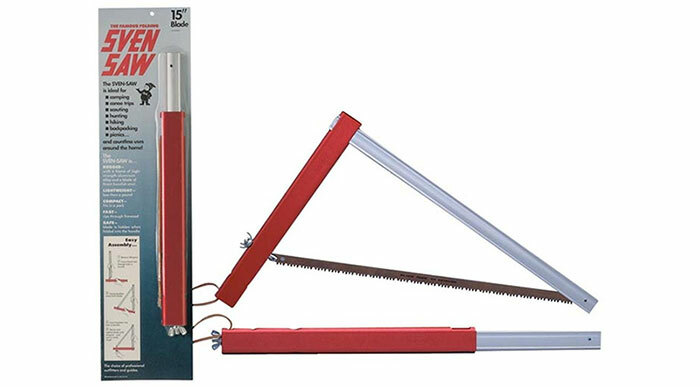 Camping saws can be especially useful if you are canoeing or kayaking in creeks or narrow streams where fallen limbs or trees blocking the way are common. They are just about mandatory if you are doing trail maintenance or are developing a new trail. Saws can be handy for camping if you are cutting blown down or fallen limbs for firewood. Saws are not by nature a Leave No Trace tool and should always be used with discretion. But under certain circumstances they are an invaluable camping and trail maintenance tool, whether the trail is a walking trail or a canoeing / kayaking trail. Here are six recommended camping saws that will be handy to have in various outdoor situations. The saw folds flat while remaining completely assembled. No tools are required. It can be stored in a pack without the worry of lost parts. The standard 12” blade is replaceable. The rubber handle provides a firm grip. The saw has 4 pivot points that allow you to use the full length of the blade to cut wood with a larger diameter. It weighs 14.8 oz. 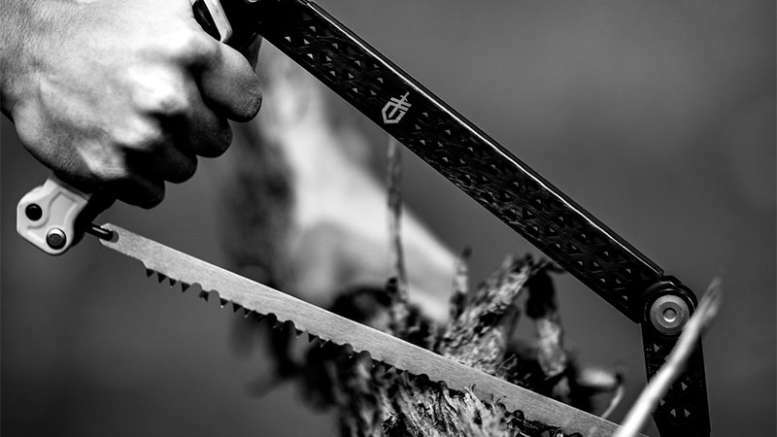 The Outdoor Edge PS-100 Pak-Saw comes with 3 blades for cutting wood, bone, and medal. It fold into a nylon storage case when not in use. It can be expanded from its folded and packed status into a ready-to-go 12” saw in a few seconds. The saw has a 7” blade and a 9” handle. A button unlocks and locks the blade. When it’s in the closed position it’s not going to open by accident. Cuts green and dry wood as well as plastic or bone. The blade is coated for rust protection and to lower the friction of the cutting. It has a plastic handle with a leather strap. 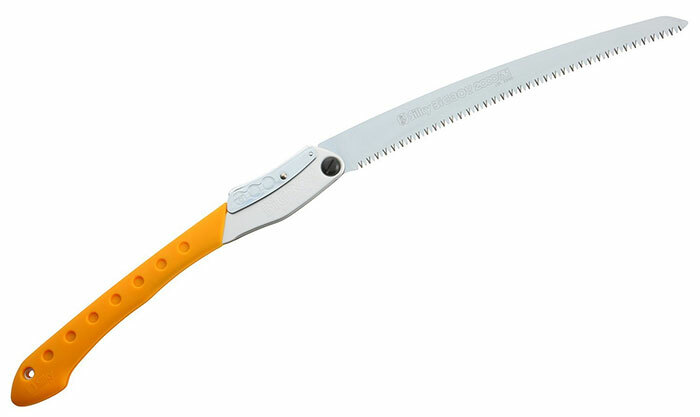 Philip Werner, the much respected and popular author of the Section Hiker website reports acquiring a Silky BigBoy folding saw for cutting larger blow downs on trail maintenance patrols. He says that he finds the BigBoy to be well suited for the removal of larger blowdowns. It’s especially handy, he says, in Wilderness Areas where the use of chainsaws is not permitted. The saw has a 14.2” blade with 5.5 large teeth per inch. It has a rubber-cushioned double fisted handle. It weighs 1 pound. The Sven 21” Saw folds to 24”x 1 3/4” x 5/8” in the aluminum frame when not in use. The blade is made of strong Swedish Steel. It weighs less than a pound. A canoeist reports using the Sven Folding Buck Saw happily for 3 years to remove strainers on his paddling trips. He says it will cut through a three inch limb very handily, but isn’t big enough for cutting larger firewood. 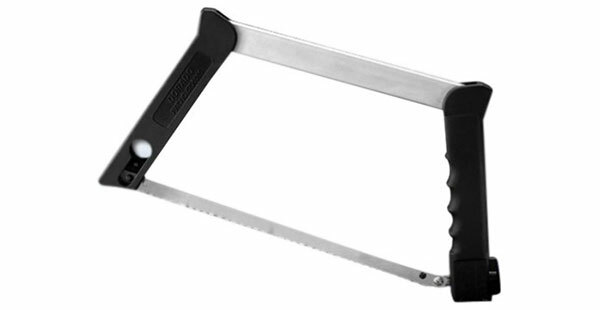 This is Gerber’s rethinking of the traditional collapsible saw design. Everything except the handle is made of stainless steel. All components of the collapsible saw fit together handily. Two blades are included, one coarse (for wood) and one fine (for bone). The standard blades are available at most hardware stores. The saw comes with a nylon sheath.